If you’re tired, beets can help. That’s right, if you’re feeling tired or having trouble concentrating you might have anemia related to folate deficiency (however, it’s also likely you just didn’t get enough sleep). Turns out, beets can help. They’re a great source of folate with more than one-third your daily needs in a one cup serving. If you need to know about beet serving sizes, check out this infographic: What’s a Serving? The Fruit and Vegetable Serving Guide. Beets keep your arteries free and clear. 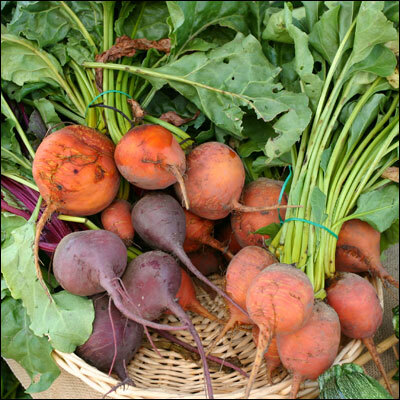 Beets are a good source of fiber with almost 4 grams in a one cup serving. About half of that fiber is in the form of soluble fiber, which works like a sponge in your intestines to clean up and remove cholesterol so not as much returns to the bloodstream and can collect in your arteries. Intestines, blood, and cholesterol, how’s that for a glamorous explanation!? Did we mention they are sweet, buttery, and delicious? One cup of sliced beets has about 75 calories, 3 grams of protein, and 3 ½ grams of fiber. That’s 75 calories of bliss in our book! If you have a good beet recipe, we’d love it if you’d share it. the effort that getting ready for an event requires.